The Donors’ Forest was unveiled at the Beechwood National Cemetery in September 2010. I was awarded the commission after winning a national competition to create an installation in the newly built Memorial Centre at the cemetery. For my Donorsʼ Forest, I chose to work in the tradition of the commemorative tree. 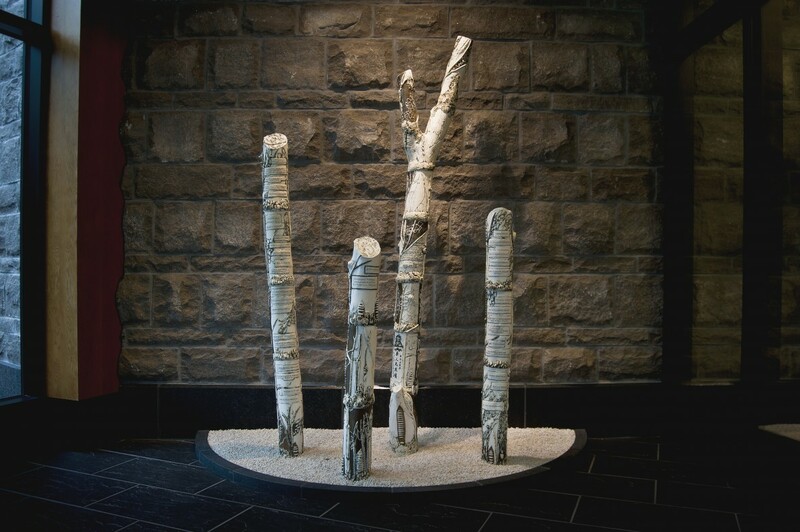 A seven-foot tall, forked, porcelain tree sits at the centre of my Donors Forest, mimicking the Y-shaped wooden columns in the Memorial Centreʼs Sacred Space. The inscriptions on the treesʼ surface commemorate the soldiers, poets, politicians, and the cultural diversity of the Canadians buried at the Beechwood National Cemetery. Images of public monuments in the cemetery have been transferred onto the tree. I also embedded leaves and other plant matter I collected on the cemetery grounds into the porcelain’s surface. The organic matter burns off in the kiln-firing, but its impressions remain. My Donorsʼ Forest at the Beechwood National Cemetery of Canada pays homage to the giving spirit of the donors who made the new Memorial Centre possible, while at the same time remembering the brave spirits of those who have gone before us.